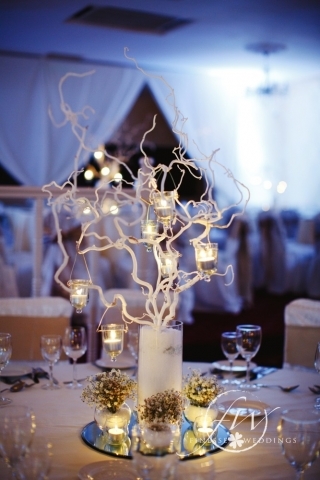 Winter gives you a great theme to work with for your wedding. It can be a magical and romantic time of the year. 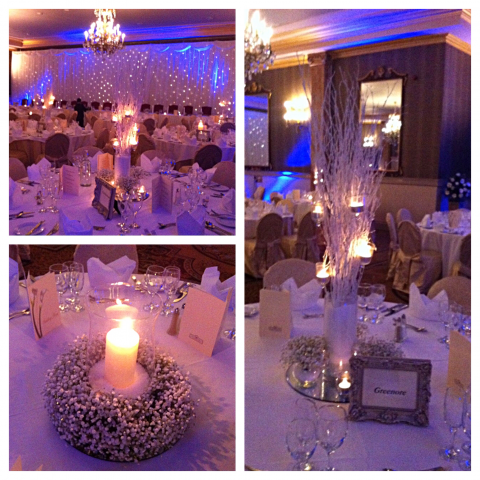 So we’ve put together a selection of images from some of the winter weddings we’ve previously styled to give you some ideas. Tealights and candles a great way to bring atmosphere to the room. We love using tealights at the base of our centerpieces or lanterns leading into the ceremony or reception area to give the guests a warm welcome setting the mood. 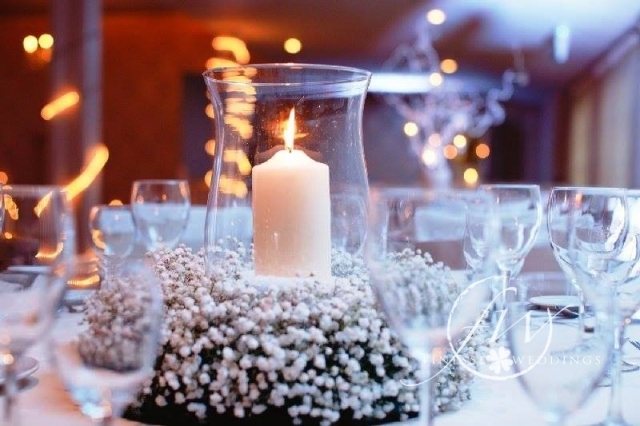 We use fake snow to winter theme some of our centerpieces which look elegant in any room. Our manzanita centerpieces and hurricane vases are perfect when decorated with snow and winter flowers. Especially with a touch of glitter added in for that extra sparkle. Glittery sequin table runners look amazing in your photos. They are a subtle way of adding colour to your tables to tie in with the winter theme. This year we’re going for gold as our favourite sequin runner! 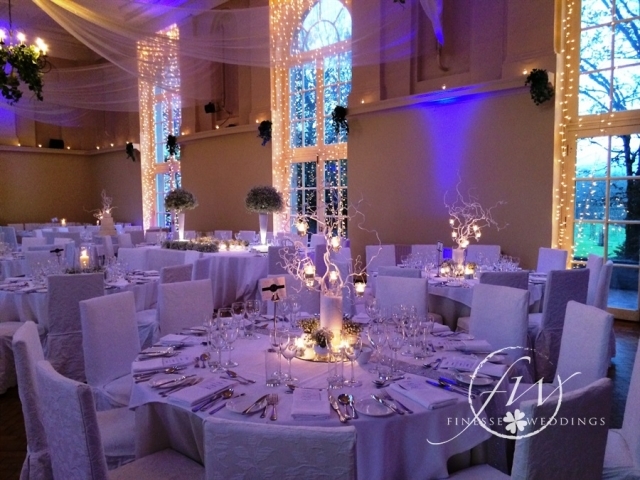 Hanging fairy lights behind your top table or using a free standing fairy light backdrop will ensure that your wedding photos have a exquisite background. You can also create magical entrances using our fairy light door drapes. A big part of creating your winter theme will be selecting the right colour. We use our uplighters around a room to add colour tieing in with your theme. In the examples below we’ve used blue and purple uplighting to enhance the winter feels. 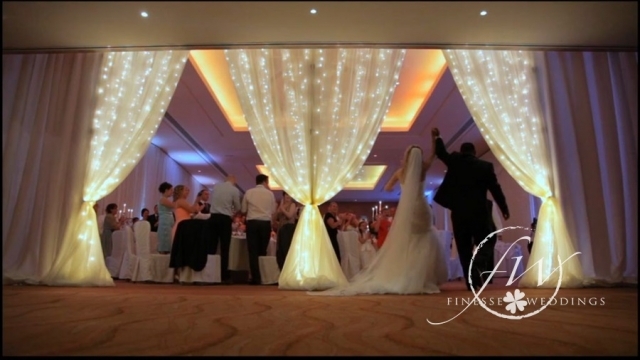 Ph: 086 851 0726 Email: info@finesseweddings.ie Showroom: Unit C2, Acorn Business Park, Rathangan, Co. Kildare, R51YN61.